With my new forum now be able to do a lot more than my blog, I think it is unlikely I will continue to update my blog from now on. I did wonder about continuing to update my blog, but I do not really have time to run a blog and forum. The forum can do a lot more anyway, so while I like the blog, there is no real use for it any more. It of course was rather short lived blog, but as the blog software is basically awful to use and buggy, I just do not want to continue fighting with it any more. As mentioned before, I am finding it increasingly difficult to type, and even writing a few lines can become agony. So having all my work centralise and all my posts and help centralise on the forum will help reduce the amount of typing I have to do and ultimately and hopefully, reduce my workload. I am using voice recognition mostly now it is allowing me to continue replying to people's emails and questions. But obviously, if all this correspondence can be posted via my forum, the information will help others in the future most likely. This ultimately will save me having to reply similar questions time and time again. Shipping will start towards the end of the week. If they sell quick, I may considering doing another small batch in the future. PeST is the acronym for PS2 Enumerator for the Atari ST. 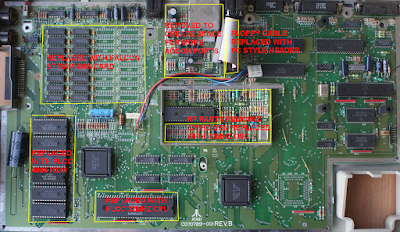 It enables any PS2 mouse to be used with the Atari ST / STF / STFM / STE / Mega / Mega STE / TT / Falcon etc. PeST is completely automatic and fully plug and play. No drivers required. A clever unique internal software design allows 4 speed options to be selected for up to 4 times faster than any regular Atari mouse. PeST was originally produced in 2005-2010 and was discontinued in 2012 due to lack of demand. However after a recent poll, a lot of people expressed interest in a new production run of these. So I have started to make up a limit number of PeST's which will be on sale in my store in due time. After much consideration for almost 2 years now, I have opened up my own forum. This forum is for current hardware developments of mine (but can include 3rd party stuff also) and to offer support for my products. There will also be general hardware fixes and tweaks and repair guides among other things. I decided to open this forum as my blog was a bit to limited to do what I want. My website holds a lot of information, but didn't really fit to a blog of daily or weekly announcements or activities. A lot of my blog posts just become "lost" over time with no real way to organise or find posts. I feel a lot of good information is just being pushed out of existence! A forum would allow me to do much more and fill in the gaps for support between my blog and website. Other groups and forums I may use have just become to much trouble to keep track of things. People are making repeat suggestions all over the place and I can't keep up with it. Not only that, people are just repeating the same things over and over which just becomes annoying after a while. So if people have suggestions for something like the STFM remake project, then post on my forum! There is also the countless emails I get each week, where basically I am just repeating myself on the same subjects over and over. Mostly such people try to get help on forums, then give up and email me directly for help. Overall, a new support portal is needed to centralise all my work and offer support to people. This way, rather than repeating myself to various people on various topics, people will be directed to my forum instead. So when I reply, other can benefit from the reply. This will save me a lot of work long term. The forum rules are strict and we will not tolerate any BS , negativity, or arguing with others. I am personally sick to death of all the negativity and BS on other forums that I rarely go on other forums any more. Forums are supposed to be a fun friendly place and I just don't see that any more with any forums, not just Atari ones. Far to many people have left because of such issues, including myself and nothing ever gets done about it. Its 2017 and its time to start over. Lets get back to quality work and make new friends, learn new things and help each other. Leave all the negativity and BS at the door! My forum will be WIP (work in progress) for some time while I update it. I hope others will join and help make the forum a success! 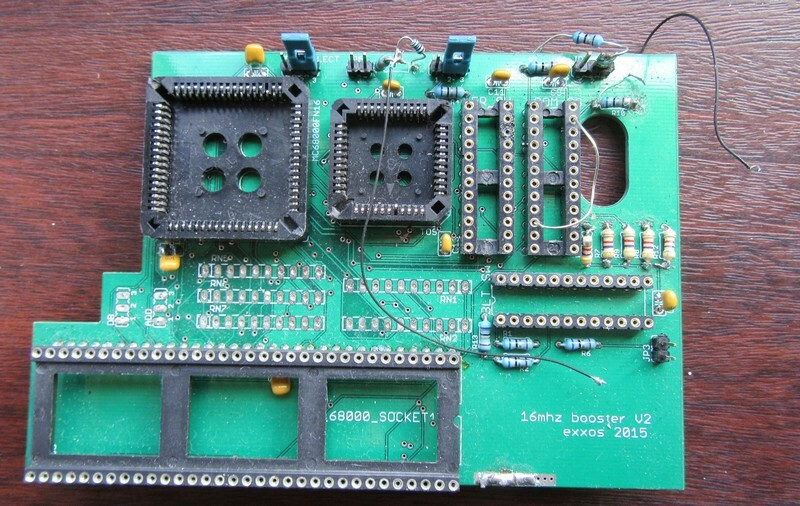 While testing out a booster prototype I found that it refused to work with the 68HC000 CPU. I first thought that there was some problem with my PLD code. 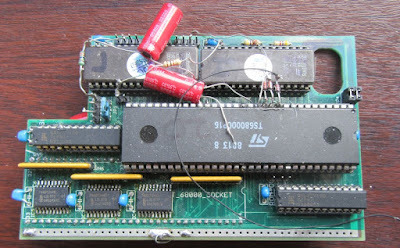 Later I had bypassed the PLD totally and hardwired the 68000 DIP socket to the PLCC socket. So my PCB was basically a DIP to PLCC adapter. Problem was, it just refused to work. Oddly though, a older TTL (IE original PLCC CPU) worked fine. To which point I blamed the 68HC000 CPU for being faulty. Several CPU's later, and I couldn't figure it out. The motherboard and booster "adapter" worked fine with a TTL CPU. But adding in CMOS (HC) CPU refused to work. I decided to test those CPU's in my STE and they all worked fine. This made no sense at all. How could the CPUs test fine in my STE but not work in my simple adapter PCB ?! I dug out a original V2 booster and it booted right up first time. With the HC CPU. So clearly the issue wasn't some compatibility issue with the CPU itself and the motherboard. I even tried a second motherboard and that behaved exactly the same. So the motherboard itself wasn't the problem. Just 2 motherboard refused to work with my HC CPU, but would work with the V2 booster which did use a HC CPU. Again, this made no sense. So I took out the CPU from the V2 booster, it was known working setup of course, and put in another one of the HC CPU's I had been testing. The V2 booster did not boot up. I tried a few more CPU's.. booster wouldn't boot at all. At that point I tried the boosters original CPU (that worked) in my new V2 design and it did not boot, still. I thought to go back to "square 1" and put back the known working CPU back into the original V2 booster to make sure I had not broke anything or had a bad connection. To my amazement, the booster refused to work! WTF is going on ?! I tried the original DIP CPU back in the motherboard and it booted right up. So clearly not a motherboard problem. So now I had re-tested all the HC CPU's back in my STE and each one worked fine. So at this point I had assumed that I had managed to kill the V2 booster. Though that did not really add up since the boosters own CPU refused to work in a simple DIP to PLCC adapter. But wait it gets better! Placing the original TTL CPU into the V2 booster worked, and even worked in my DIP to PLCC adapter (which was the next gen V2 booster hacked that way). So clearly the CPU's were not faulty, The boosters were not faulty, but the CPU's refused to work in the boosters ?! The same CPU's had been used countless times for years in my booster projects! This all made no sense at all. It was the weekend, I spend the weekends with my girlfriend where I ranted on about all this not making any sense. 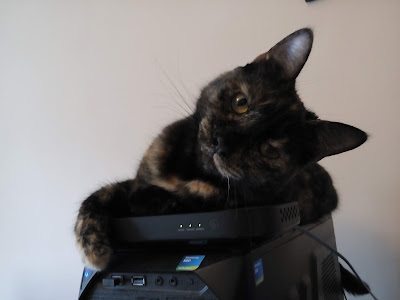 She suggested maybe the new CPU's are damaging the sockets somehow which would explain why the V2 booster, worked one moment, and refused to work after some CPU changes. Though this did not really make sense as to why the CPU's worked in the STE. But at least it was a new direction for me to think on. 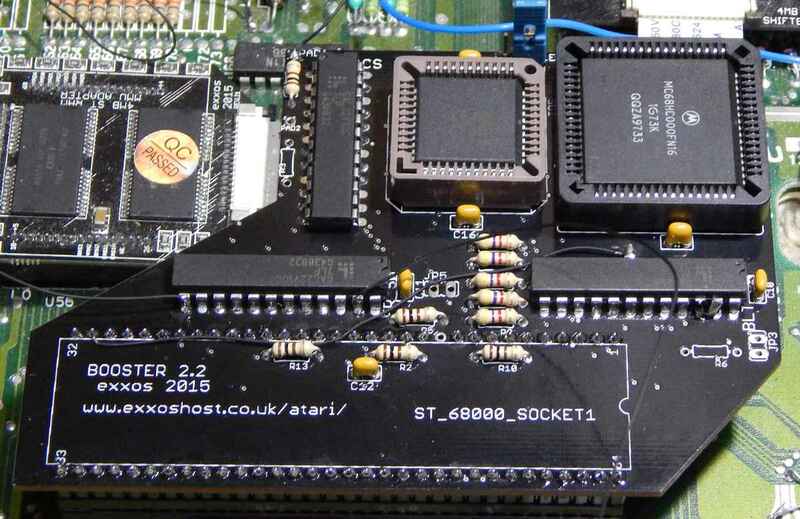 As all my Atari stock was at her flat, I found out the old TTL 68000 CPU's and the newer HC CPU's as used in the STE boosters and said these are the CPU's they are identical. she looked at them and said they aint. Like, what ?! She noticed the HC CPU's pins were actually thinner and a slightly different shape! Odd I thought.. She also suggested again that maybe the new ones are damaging the sockets.. So I routed though some kits and dug out a socket from the blitter kit and let her look at those. I also thought, well, those CPU's work in the STE boosters, so I took a socket out of one of those kits as well. She looked at both sockets and both CPUs and noticed the HC CPU fits in one socket but not another. But the old CPU actually fit in both sockets.. like, WTF ?! The sockets were slightly different. One socket had pins which were more '\' shaped. The other socket pins were more bent, like 'Y' shaped, well, half the 'Y' shape that is. Basically not a straight pin. I thought the "slanted" pins would contact better if the CPU pins were bent. 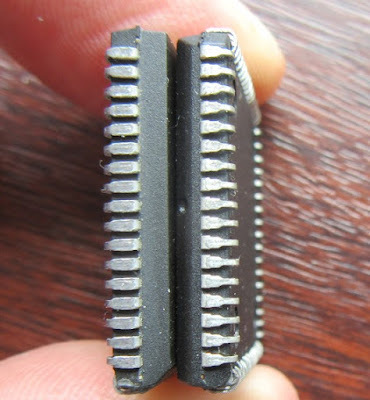 Though maybe it was the CPU pins on the newer HC CPU being thinner which for some reason did not like one particular socket, basically the slanted pin ones. Though this did not really make sense either. She later found that the older CPU's fit fine in both sockets, but the newer CPU was a really tight fit in one socket, but not the other one. I looked into this and what I found next actually shocked me. The HC CPU pins on the side are actually WIDER than the original CPU, so the contact area should be better on the 'Y' shaped pins. Though this did not fully explain things either.. 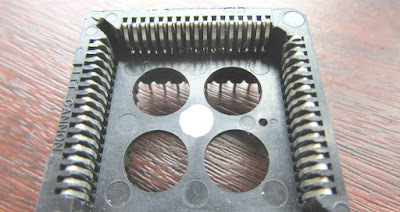 The slanted pin sockets, the plastic spacers (as I call them) being thicker, and the HC CPU pins being wider (at the top) actually resulted in the plastic parts of the socket, pushing the pins inwards to the point where the CPU's would no longer make contact in the other PLCC sockets. Oddly the older TTL types had wider space at the top, so it would never matter for those, which is what I found. At some point in all this, I found also that once a HC CPU was tried in a slanted pin socket, not only did the socket bend the CPU pins out of shape, but it also distorted the plastic spacers and did at some point cause the original TTL CPU's not to work either. At that point I thought I had killed my V2 booster or motherboard by placing a faulty CPU in it. but it just wasn't so. So now we have the answer to all this chaos! 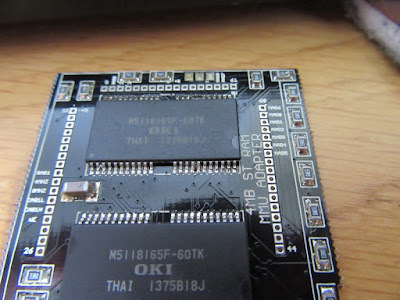 The original CPU's (TTL type, or even GLUE, MMU chip etc) will work in either type of socket without problem. BUT, the HC CPU's will ONLY work in the 'Y' shaped (bent pin) type of sockets. 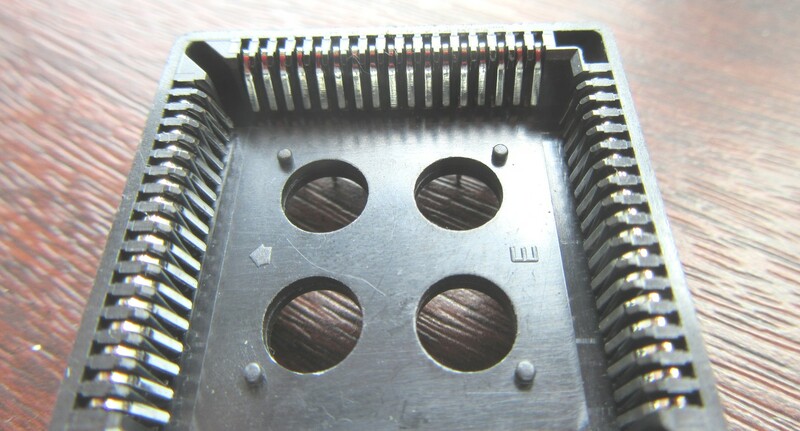 If you try and place a HC CPU into the '\' shaped (slanted) pin sockets, it will damage the socket AND damage the CPU pins. The slight "red herring" in all of this was all the CPU's worked in the original Atari PLCC sockets even though the CPU pins were actually bent and wouldn't work in any other socket! So lesson learned that newer sockets are not better than the ones in the 80s. I guess its also annoying that now any sockets I buy, I have to really check they are the bent pin types before using them in any booster projects. Of course such sockets do not matter with older chips. I think also there is some split blame here. I can blame the slanted pin sockets for bending the CPU pins, Or I can blame the HC CPU's for damaging the sockets! Or maybe this is just down to tolerances. Maybe the sockets are on the max tolerance along with the CPU. Just so happens that "both" of them being on tolerance extremes that they can actually damage each other. Madness! 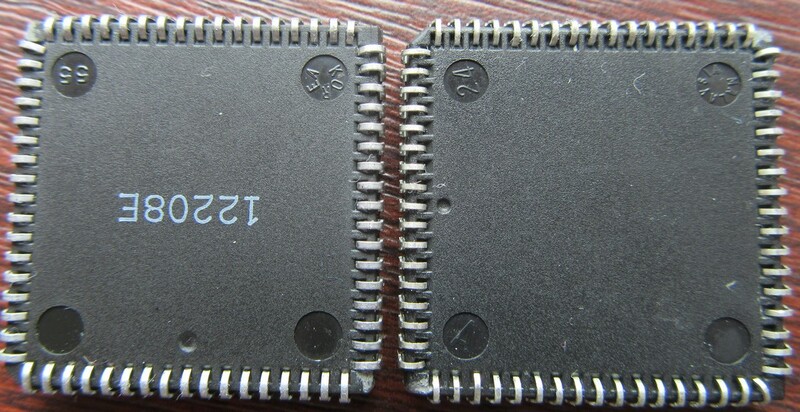 Either way, I now know that all PLCC IC's have differences along with the PLCC sockets. The difference are so tiny at a first glance they would go un-noticed. Though I had to post about this as this drove me nuts for 2 days. Hard lesson learned... Never assume anything is as you think it is, and even a innocent PLCC socket can have tiny differences that can stop something from working and test your sanity.. It quickly came apparent that my first design was simply to large :( So a total re-think was in order. This is only a "quick" layout to see how things would route. What we have now is the BLITTER, CPU, GLUE,ROM under the PSU. This space is actually wasted and no real room for any expansion card. So it makes sense to route there. The MMU sits just in front of the PSU, the ST-RAM card is also there and the bus isolators under the ST-RAM card to save space. The shifter is now located right next to the monitor output along with the RGB drivers. 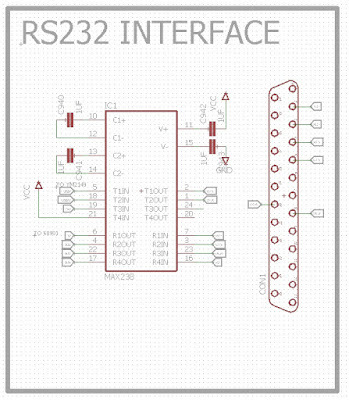 One change which was suggested by Rodolphe was replacing the RS232 area with a MAX232 IC. The MAX232 did not have enough IO's so the MAX238 was used. The good thing about this IC is that it is more compact, the 1488 and 1489 drivers are no longer needed. Also the TL497 voltage generator is also no longer needed as it is built internally in the MAX238. So overall it saves on a lot of parts and PCB space. There is a MAX235 which is exactly the same as the MAX238, but it does not need the external capacitors. I was going to use that but its easily twice the price of the MAX238 :( So no use in spending £5+ on a IC where 4 cheap capacitors can be used instead. So the current design now uses the MAX238. I am also now working to align the connectors to their proper locations as well as improving the IC layout. I hope this will allow me to reduce the PCB space to half the size so making a prototype will cost a lot less. There are also a couple of resistors packs which are linked all over the place. I may remove those into individual resistors or 2 smaller resistor packs. No use in having tracks running right across the board just for a pull up resistor. I am still considering what to do about the TTL chips. They could easily be replaced by a GAL. Though problem then becomes more routing across the board to go to 1 GAL. A lot of gates in each IC are not even used. Or can be done with less gates. There is also the slight issue that it makes the design a little more complicated as GAL's would need to be programmed instead of basic TTL chips. Though considering in the future there will be a big PLD for the booster logic. I suspect overall I will moved to GAL's instead of dedicated TTL chips. Well maybe not exactly as I have a epic amount of tidying up to do yet. I also need to add in de-coupling caps and the reset switch has gone AWOL. The "back" IO connectors are basically in the right place. Though I need to measure a real motherboard and make them align with the case properly. The Cartridge and midi ports are just plonked on just for testing. As this board is a lot smaller than the original, Then alignment doesn't matter at this point. I will probably add in a single IO expansion port onto this. Then at least at some point I can route the alt-ram stuff into a card. Once working, I *might* add that into the next design as a stock feature. Or it may be a custom IO card which may fit under the PSU. Currently there isn't any room for anything under the PSU, not a expansion card anyway. Though I think a right angle connector which is dedicated to alt-ram would easily fit there. Then at least its not taking up a main expansion port then. Similar with the ST-RAM card. Because the Falcon card is 32bit, this means a lot of double routing to convert to 16bit. There isn't much that I can do about that. Though the bus isolation buffers are also a huge mess of tracks. Again, I may just replace them with a larger PLD. Though I am not sure at this point if its a good idea to move away from dedicated TTL chips or not. For example, I don't want to force people in the future to use Altera chips (which is what I am using currently). Ultimately, there will be some more "glue" logic. Which will contain the booster logic. That will be Altera most likely. Though at least it is a optional extra. So the plan now is to finish off the current design. Lots of messing about with stuff to do now. But it is 100% routed now! I had a program running to check time to route it, and its about 28 hours! 36,000 left button mouse clicks and mouse moved about 3.5miles! Considering the work involved I think 28 hours is a huge accomplishment. Of course it will take a lot more time to add in the booster logic, IO expansion headers and other stuff. Though at least this is something now which is almost ready to be prototyped! I was trying to keep all the PLCC IC's pointing upwards, though it proved not to work out like that. With address bus on the top of some IC's, sides of others, bottom of others, it just wasn't sensible to have buses wrapping half way around each IC. So they have been positioned to allow the best flow of routing for the address and data bus. The MMU to ST-RAM card proved hard going. I had the bank of resistors vertical, though they got in the way of the databus, so moved them downwards and horizontal. I had to route the MMU area 3 times before I was happy everything was flowing correctly with the layout. The routing of the ST-RAM card was a small nightmare. As the ST-RAM card is 32bit, it had to be converted to 16bit and then routed to the address bus and then to the bus isolation latches. I managed to do it in 3 layers. Just no other way to make the routing easier other than developing a new ST-RAM card. Which I may do in the future, but for now its not important. The 4 bus isolator IC's are located under the the ST-RAM card so it saves a lot of PCB space. Most of the Shifter has been routed to the bus latches. Also the RGB drivers have been routed. That is basically about it so far. I think it will take several hundred hours to route in total. So its not going to be done anytime soon! Some small technicals that so far the address and databus run horizontal across the board. The bulk of the address bus goes to the PLCC IC's. Generally only A1-A4 are used on other IC's so they shouldn't be a problem to route from the bottom side address bus to the top of the board. The databus is across the top of the board as most IC's need access to it, so having the databus accessible near the top, where IO connectors will be is a wise move. 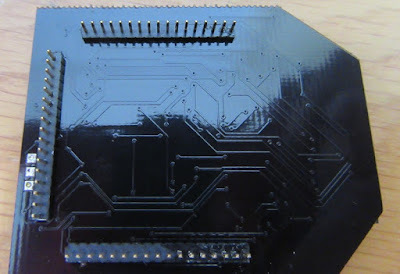 There is something which is becoming apparent, that the IO connectors may not end up in the same order or location as the original board, at least not on this prototype. It looks like the bulk of the IC's will be located under the PSU. I wanted the shifter to be located next to the RGB connector, but it still may end up some way away. But I will try and squash it down as close as possible. Other ports will end up several inches away from where the actual controller IC is. Which isn't ideal. Though as I am trying to keep to the original case layout, then there isn't much choice but to have tracks running across the board. Its a huge waste of space. Though with new cases looking unlikely to happen, then it will just have to be like that. I estimate a quarter of the motherboard will be used with the new layout I am doing. This leaves 75% "free space" for other expansion connectors. Probably a large on in the center to allow a 030 addon card. Then some small expansion ports for whatever else. Now this board is a prototype of the BASIC AS POSSIBLE STF design. I am not adding expansion ports to this , and I am not adding any booster logic (simply because its a long ways of being finished yet and I can only work on one thing at a time!) This board will be as small as possible to keep prototyping costs down and will just be used to verify the ST actually boots and everything works as it should. I guess this could be called a "Mini STF"
Once this is done and tested, then I will work on a re-design to match the STF's case layout. Once that work is done then whatever space is left will be allocated to expansion connectors. I will then have to design a new booster series to fit this motherboard and do testing etc. So we are probably looking at 12 months+ worth of work here. Though I hope the initial prototype will be manufactured sometime over the next 6 months. This also means I do not have any time to develop new addons. So those who want USB, HDMI, LAN, GFX CARD and everything else, well you yourself will have to develop that and create a addon card as I just do not have anymore time to work on anymore projects. My hands are full trying to keep stocks up in my store and I am a long way off finishing my booster work. So I am probably going to be maxed out work wise for several years yet. I have had a LOT of suggestions for tweaks and mods. A lot are just not possible as they are just to time consuming. Though smaller mods like DRIVE AB Jumper swap and speeding up the serial port can be done easily and will likely get done next revision. A lot of issues are down to limitations of the MMU. 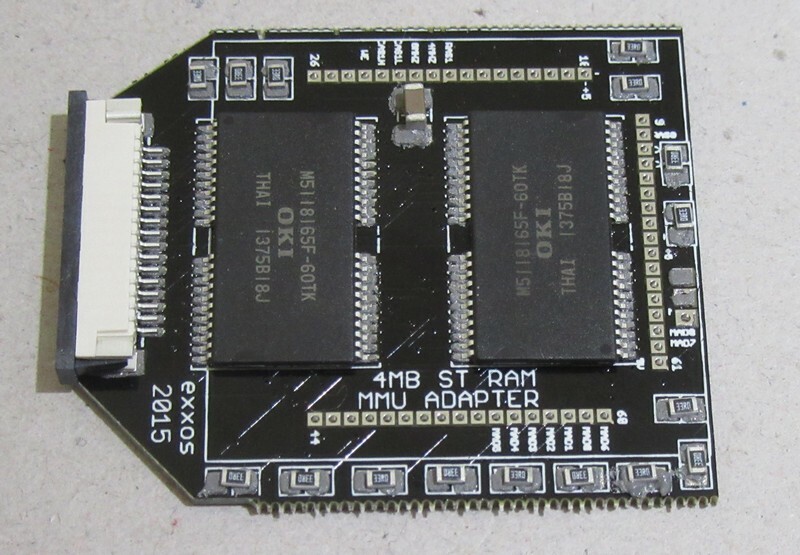 For example, 14MB ST-RAM isn't possible with a new MMU. It will also likely need new GLUE logic as well. So its not so simple. I just don't have time to develop a new MMU. 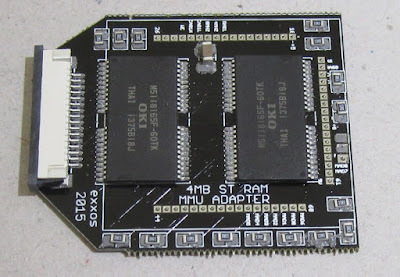 If someone wants to develop a MMU clone which will allow 14MB ST-RAM and allow SRAM to be used, at 32mhz clock speeds, then pleased develop a solution I can plug in and try out. If it works then it could be included as standard in future revision. Though so far I have asking for help with this for almost 10 years now. I know of the MiST code, I know of Suska code.. its means nothing to me. I have no idea about FPGA, or VHDL and I just don't have time to mess about with it all. I have my hands full with so many projects that I just don't have time to develop a new MMU on my own! So while it would be awesome, and open the door for many mods, I just have never seen anyone willing to step up and take on the project. I also get a lot of "why don't you do this" or "why don't you do that".. Well, I am doing it all my way and doing what I want to do, end of discussion. If people want something more than I am developing, then go and design and develop the bloody thing instead of dumping 50 projects on my door stop for me to design all on my own. I'm not saying I am closed to suggestions, but people have to be realistic on what this new motherboard will entail and the amount of work involved. I will provide the ground work for people to develop what they want. If people don't develop anything for it, then don't complain to me about it! As for my upgrades like the CPU boosters. I am just going crazy routing the CPU socket to a PLCC CPU every time. I mean wiring up data bus to data bus, address bus to address bus, like 50 times over is just not fun anymore. I have several designs of boosters which never saw the light of day. Plus several revisions of each version. It boils down to basically replacing the 68000 CPU each and every time on each and every booster board. It would just make a lot more sense to have a motherboard which simply has a fast 68000 built on so I just don't have to spend endless hours basically routing the same thing over and over. Addon logic would just be a few wires in a small PLD. Upgrades can be done many times faster and save me endless hours of work! I also am tired of fighting "noise" issues on the motherboard. It probably takes up 90% of the development time for each project as I have to debug and trace random issues. I personally want to create a solid universal platform to be easily upgraded. As said before, its just madness to keep spending time trying to develop upgrades for a machine which just isn't upgrade friendly. I would rather spend the time designing this new motherboard and fixing all these issues to allow faster addons to be developed in the future. Some people just dont get why I am re-creating the motherboard and not making huge changes. Well thats not the aim of this project and isn't the point in this project either! So that is my basic overview for the "goal" of this project and some information as to why I am doing this. If the community want to make this into a more powerful ST then people will be able to easily build on my designs and improve and make any changes they want. Prototype cartridge PCB arrived. This uses my little RTC kit which solders onto the larger cartridge PCB. I added on the cartridge connector on the left side of the PCB. I need to try this out, but finding connectors is hard going. So I will re-use one from a scrap motherboard to try another time. Not much to really say. It works and shows the time on desktop with a ACC. I have been trying for days to work out why the assembly of these are failing. It seems half the time the IC doesn't solder to the actual board. Though if I use a hotter profile, the PCB itself seems to burn up and break :( I even had one IC which seemed to bend up on one end which is madness. I have tried various SMT pastes, at various heat profiles. I have even tried just solder pasting the PCB and making sure no shorts on the PCB after heated, and then applying the IC's on with plenty of flux. The IC does not seem to "sink" into the solder like it should. It would seem the PCB isn't getting hot enough to melt the solder properly. Though heating more seems to cause even more damage. I also wonder if the PCB itself is warping as it is heating. I think I have seen something like that happen before as the copper heats, it can bend the PCB. As the IC does bend the same (basically remains straight) then the PCB isn't level to the IC and causes parts not to solder correctly. Its possible that could be another problem. 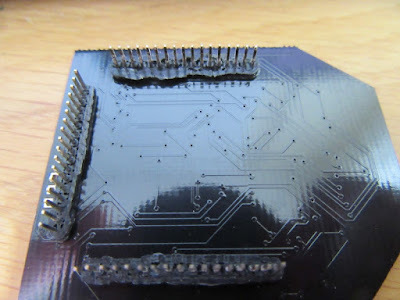 I think there is also a possibility that because I am adding flux to resolder with my gas soldering iron, that the flux leaves a residue making it hard to see solder bridges between pins. It is possible once a bridge happens, its blowing the IC up. I have managed to kill 2 MMU's so far :( Though its also possible that the 5V and 0V copper tracks were not large enough to cope with a short circuit and the tracks act like fuses and "blow". It seems the more I try and fix these boards, the worse they seem to become. Simply re-heating the IC with flux to "re-flow" it shouldn't cause more damage. So I have come to the conclusion that the PCB sux. Not only that I went for a 1mm thick PCB because of height issues in some machines. Though overall, a extra 0.6mm isn't going to matter. More to the point, the PCB is actually thin and pushing it into the socket in itself could lead to damage after a while. The previous boards were auto routed, this new board is 100% manually routed. This makes routing a lot neater and I can control better how close things are to pins and pads. Not only that, I used copper fill on top and bottom layers for 5V and 0V to make sure the power rails were "un-blowable". Of course it seems unlikely that out of probably 20+ boards that each and every one failed to solder correctly. Its just a 100% failure rate each and every time. Even by chance there should be one good board, but there never is. I know originally I made a batch of these myself and hardly had any failures. Though I think the current batch of PCB's are just to fragile to solder by hand. The last batch (as in the ones sold in my store) were manufactured by machine and mostly they turned out fine. I did have to re-flow several boards and I think 5 ultimately failed beyond repair. 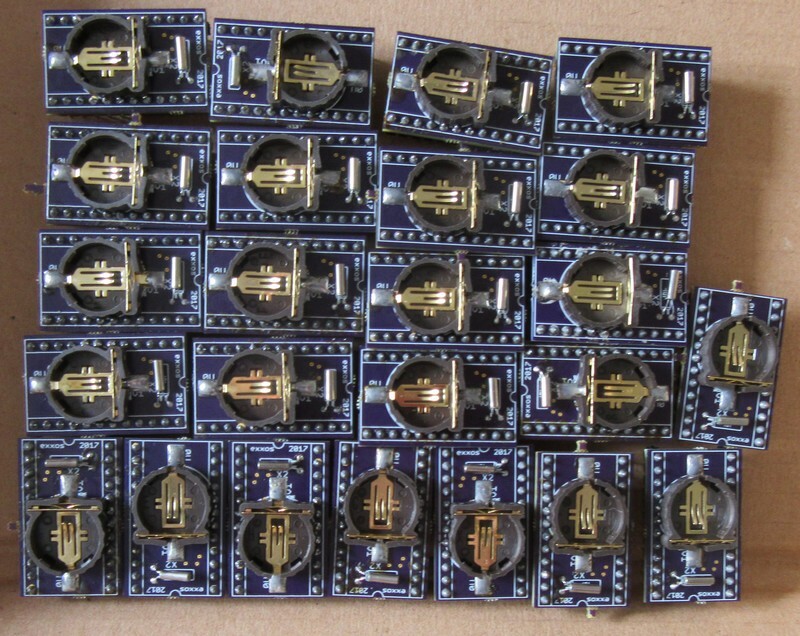 Even so, for some reason that batch of PCB just seems to be very problematic to assemble. 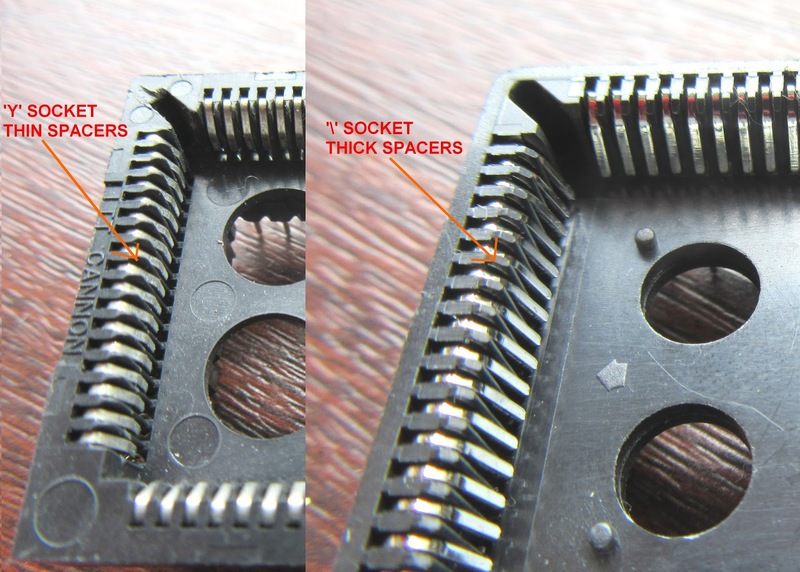 There is also a issue that the header pins themselves are so tiny, solder bridges become hard to spot and hard to solve. The new PCB has smaller solder areas to try and space out the gap between pins making it easier to see shorts. Also I had used square pads, now I used round ones , again to help prevent and spot solder shorts. 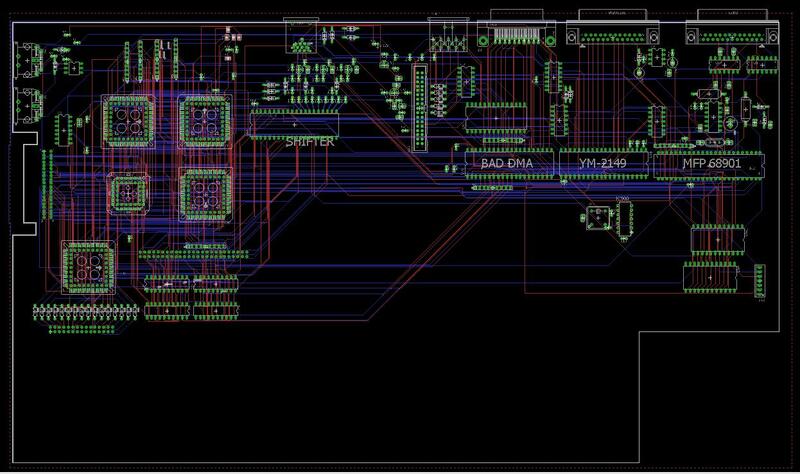 Now the new prototype PCB is on order. I paid for the faster service so I hope they will be here in about a weeks time. This PCB should be a lot stronger and be a whole lot less prone to assembly issues. While I can get them made by machine, the cost is very high in producing a batch of 30. I don't want to invest huge sums of cash into its which sell very slowly. Fingers crossed the assembly goes better on these new boards else it likely will mean the 4MB MMU kits will no longer be produced. First up I got a new "pasting jig" made. The engineer is likely no longer talking to me, but I got the design I wanted in the end and fantastic it is! Expensive, but I needed a way to speed up production as aligning the film by hand and taping the stencil on while pasting.. well.. basically took forever. Pasting Frame with Plastic Stencil. All pasted ready for adding parts. Into the oven to cook for a while..
Cleaned up and checked.. Then into my 32MHz STE for testing..
simms are now on sale in my store. I actually wasn't planning to produce the V2 booster again. Though a chap said he is interested in them to mod machines with. Though as they are "out of stock" now it caused a bit of a problem. 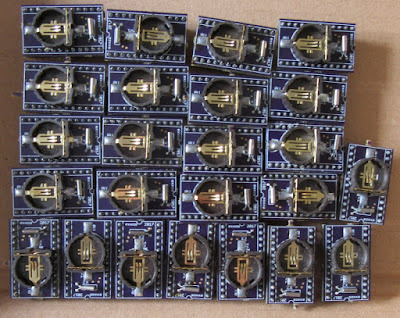 Firstly, a batch of 25-50 PCBs of 6 layers isn't cheap. The production run would be well over £1,000. So it just wasn't viable to produce them considering sales are generally slow with boosters. All 3 GAL's are basically chained in series for the logic operations, which doesn't help with trying to push into 32MHz speeds. In theory, it should run at 32mhz, but even the 32MHz drive on the STFM is so bad, it can only just drive the shifter, nevermind a extra gate in a PLD. The STE had a buffer to do that job. So I made 2 previsions with this design. Buffering the 32MHz clock by the shifter, or just using a 32MHz oscilator. The fallback is just using 16MHz. Now while the STE booster works at 32MHz, the STFM has more screwy timings to contend with. This makes 32MHz more of a problem. I stopped work on this project for a long time as I just didn't have time (or really any interest at the moment) to finish the beta board off. Though now it has just gone off to fab. This new board uses a large Atmel PLD. I have used it before on my dev-system board. Though even that I have not been able to run 32MHz. Though I made some more previsions with this new V2 design (dubbed V2.5) to run /DTACK via the PLD so I can stall the CPU a little and hopefully this will get 32MHz working. Though as time is a factor. I don't know when I will get time to write the new code or try it out. Though in theory, getting it running as 16MHz shouldn't take to long. Assuming I've not screwed up anything in the mad rush to complete the design. The boards can be made in batches of 3 now. So while I don't have to spend £1,000+ on a new batch, the price per PCB is a lot higher. This means the booster end price will be a fair bit higher. Though I am not even sure if I will sell these myself for my store or not yet. There was some previsions also to adapt the booster logic for software switching. I did some draft designs several months ago and started to route the PLD logic. Though that is as far as it got. I can't even remember how I was planning to go about it now. But its possible firmware updates for the V2.5 could be done to add features or "fixes" for 32MHz speeds in the future (if solvable). As for the software switching. I think there was plans to have my own "exxos register" somewhere to allow the booster to be turned on or off. Really this is just a bypass for the toggle switch, where that bit is mapped to a register in the memory map somewhere. A latch in the PLD and some logic to route to the switching code shouldn't really be a problem. I actually routed 8 data bits to the PLD for maybe other use such as ROM switching. One thing to bare in mind, is settings are not stored anywhere. So once the machine is powered down, the defaults would be selected again. Though I do not have any plans to do another V2 design, as the STE booster should have similar logic and the settings will be stored in the RTC NVRAM. Though it is likely a long way off before that project is completed. Overall, this V2.5 booster is a clone of the V2.2 booster, only using a more advanced PLD with a lot more IO power for various "possible" features at a later date. 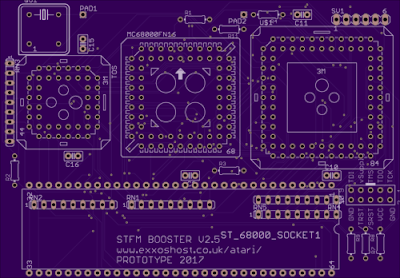 Finally got the STE booster powered by a Altera chip! For those not keeping up, I have moved away from "Coding" PLD's to drawing circuits instead. The Altera IC is a copy of my STE booster design (which uses a 22V10 GAL) only the GAL was coded, the Altera is "drawn". Though things were not as they appeared to be. This is again a problem relating to parity simms. Foolish me, I grabbed a set "close to hand" as I had been testing simms in that particualr STE, so wasn't any in it. I managed to boot at 16MHz, though I had a read error on my floppy drive. I was moving it about and the STE started running perfectly. Odd! Incidentally, the same simms work fine on a stock 8mhz setup. Turns out the 16MHz wire when going near the simms caused it to go into melt down. In fact even 2 inches away was enough to cause issues. Removing the parity simms for my own simms and there was no issuses, regardless of where the 16MHz wire was! 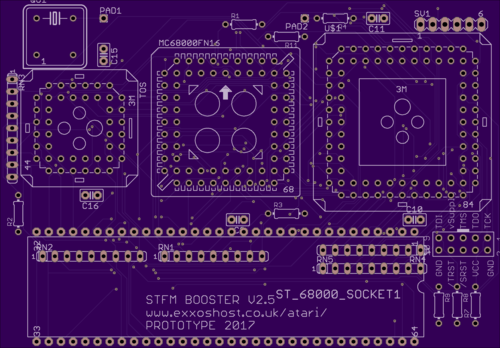 Another odd side-effect was I had to put a small SMT buffer on the STE booster PCB to clean up the GAL's output. 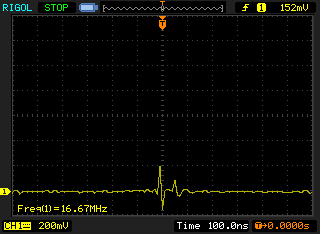 Now with the Altera , the signal was actually better without the SMT buffer! In fact I even took out the 56R resistor I had to the CPU clock. Next up "to do", is to move to the 3.3V core version. The 5V one is basically obsolete now, but the 3V core still seems to be in production. This basically means the whole IC runs on 3.3V, but it can accept 5V inputs. 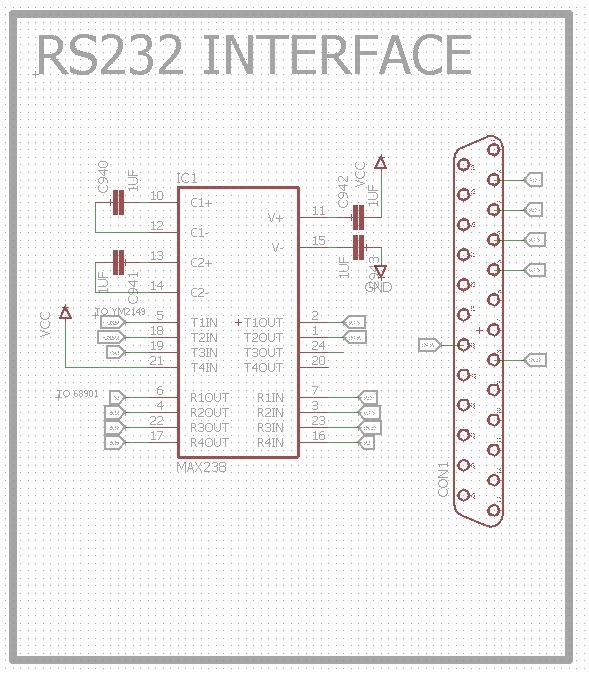 This will make it really easy to interface to 3.3V SRAM and other stuff needing 3.3V. After looking at the Altera devices, the 7000 series become really expensive for a larger IO device. Looking some more, the MAX II series seem to be a reasonable price and offer good IO interfacing. It's only available in TQFN100 type packages, so a PCB will have to be done to test it out driving ROM and SRAM. It's not very hard to see whats going on above. Classic 68000 CPU there. Plus 2 1MB ROM's. This board suffered badly from various faults and grounding issues and moved to a new design later. This was causing signals on the GAL to reach 7volts! Things went horridly wrong with that layout :( So another batch of PCBs was junked. Its very similar to the V1.5 booster for the STFM. Similar idea, just without TOS206 built on. I did think as the V2 was large, it only fitted one style of motherboard. Aside from the MEGA ST. It was one reason I produced the V1.5 booster. Though sadly, that seemed less popular than the V2 :( The V1.5 booster could be fitted to probably any machine as well. Myself and Rodolphe Pineau have long since talked about creating a new motherboard but felt it was a lot of work to which would be very time consuming and costly. Though I have re-visited that idea recently and talked about cloning the STFM motherboard. Now the first thing people will say, "why not STE", "why not Falcon", "why not Falcon with 060" etc etc. Well, time, cost, and being realistic. While other "clones" go down the 040,060 route or "emulate" the Atari ST, while a new CPU with all its speed and features is nice, without new software to use all the new features its a bit of a waste. As most software is plain 68000, then a machine should at least run that software without issues. I am not saying I am against new features, I'm all for them, though not at the expense of breaking compatibility with original 68000 software. My philosophy is , as all the software and games are 68000 based then that should be the CPU to keep. A machine which runs all legacy software just like the real thing. I want the fastest 68000 system possible. True, some things will break with demos and timing dependent code, though like with all my boosters, you can turn off the speed boost to get back to 100% stock state. So people get the best of both worlds. Firstly creating a new motherboard is not easy, especially when trying to create a whole new architecture. Not only that, parts are hard to find, impossible to solder and we don't want to create something which will become obsolete easily. My aim for this project is to create a STFM clone only using "through hole" parts. This means people can solder it themselves as there are no SMT parts to worry about. This also makes future modding a whole lot easier. 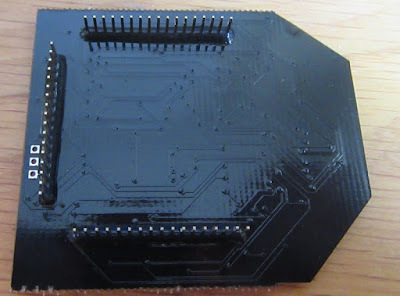 One problem with the STE is the large SMT IC MMU/GLUE logic. Making changes to the STE circuit is near impossible in some ways. The STFM however, GLUE and MMU are separately so we are able to overclock the MMU for example for higher ST-RAM speeds. So because of this, the STE isn't a good machine to clone. I want to build a machine where parts are relatively easy to obtain and solder. Of course the STE has the Audio DAC circuit and the jag ports etc. Well those could be added on as a expansion or on future motherboard revisions. My goal here is to develop a open source platform to the STFM world and let people build on what ever they want. The board in mind is the board I developed most of my upgrades for the C070789. One thing which has become apparent over the years is that the STFM has been updated with all my kits which basically takes over a lot of the motherboard already. Adding up the "cost" of buying all the kits is likely going to be a reasonable sum by itself. Plus all the assembly work etc. 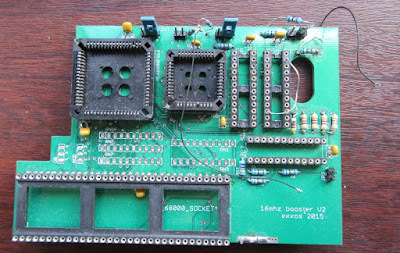 Building boosters has become a nightmare simply due to things like my V2.2 booster needing a 6 layer board in order to keep the PCB size small enough to fit in the original case. 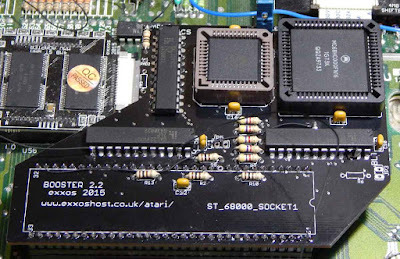 If the motherboard had a fast-rom and fast 68000 to start with, then the cost to add a booster wouldn't be much more than adding in the extra PLD logic. Plus no problems with fitting, saves endless hours of routing PCBs in a small area. Multiply that idea with several kits and you get the idea..
We mostly have 6 chip or 2 chips TOS. The first upgrade which normally gets done is to convert to a PLCC ROM which can actually hold TOS102 and TOS104 normally. So the new motherboard would simply have a PLCC ROM. The ROM is easy to change and update and can run at 32MHz. Similar with the "mars bar" CPU. The DIP maxes out at about 24MHz. Its power hungry, huge and the HC PLCC version is much better. 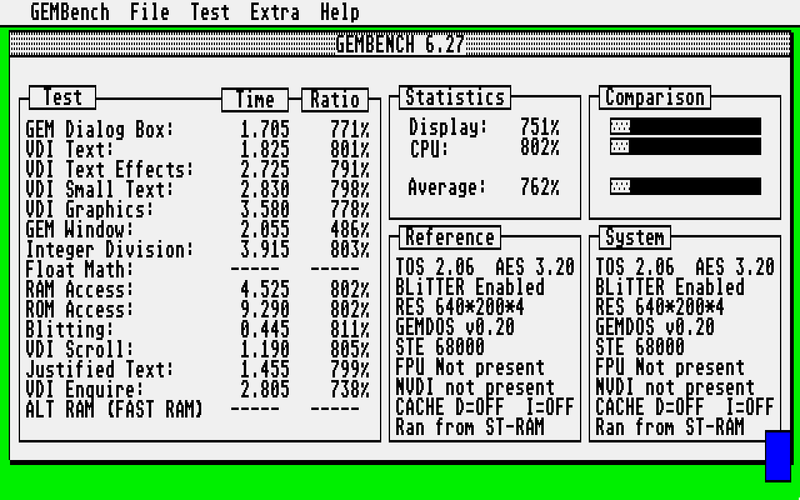 Its lower power, more stable, can run at 32MHz. Having this CPU and ROM as "stock" means adding a 32MHz booster wouldn't be much more than adding in a small GAL / PLD IC. Similar with 1.44MB floppy drives. Always having to remove the WD1772 just to add a little logic. Similar with adding RAM expansions, never easy. Overall, trying to continue in this direction just isn't realistic anymore. Not only that, We have PCB layout issues contributing to the DMA issues and god knows what else. It all needs fixing properly. The only way is to just create a new motherboard, one that is more user friendly and basically has various improvements including adding on some expansion ports! Its the same old story, people want IDE, people want fast-ram, RTC, flash rom, 030 CPU, this and that etc. Well, people will ask why not build all this into the new board ? Well , time and cost. Do people want a board next year or in 5 years time and costing a lot more ? Everyone wants something different. So building a basic machine which the possibility to expand to whatever people want is the best thing to do. I also want to keep to the original schematics as much as possible. I don't want to build in huge amounts of changes and over complicate it. I want a simple as possible STFM design where people can develop their own addons and use the expansion connectors. The expansion ports will probably follow similar lines to the falcon's expansion connectors. I can speculate that 50% of the STFM area will be free for adding expansion ports. Its possbile 3 or 4 could be added inside for example. There will be larger areas to add future boosters easier like adding a 030 CPU addon card. Once the STFM has a PLCC ROM and CPU, it frees up a huge area of the PCB already. Similar with the RAM, 2 small DRAM IC's like my MMU kit can give 4MB. So the whole area under the PSU would become free real-estate. While on the subject of RAM. I did first think of adding on a 4MB 72pin simms. Though its not really future proof. With simms becoming harder to find along with the socket, its not a good idea. 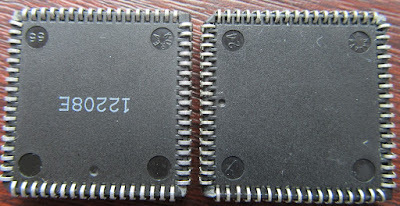 The alternative is the 2 DRAM's, but they are SMT. I don't want to do that. I could produce a RAM card , but I don't want to create myself even more work in the future and don't want people to be limited to only buying my RAM card. After some thought, The idea of using a RAM card like the falcon came to mind. I mean lots of 1MB or 4MB cards are around for almost pennies. It also makes it more future proof as alternative RAM cards can be made if needs be. It also means the MMU and ROM can likely go under the RAM card. This will also save a lot of PCB space and also make the PCB routing a whole lot easier. The next main obstacle I saw was the shifter area. So many parts. A lot of them are not needed if the RF box is not used. Also a lot of the circuit is generating the 32MHz clock which can be done with a simple oscillator chip. The only thing which is left is the RGB drives. Myself and Rodolphe did look into adding in a video DAC there. Though in the end, we decided its not a good idea. In anycase, the MEGA ST shifter circuit would be used. Its simple, only really needs the Shifter and the RGB drivers. So a lot of parts wouldn't be needed, and saves a fair chunk of PCB space also. IC's become obsolete, generally get smaller and turn into SMT parts so small they are just impossible to solder by hand. With the simple RGB transistor drives the STFM has, its only a few transistors and resistors. It keeps thing simple and we don't have to worry about parts becoming obsolete anytime soon. I do also think the circuit can be done with less parts like on the MEGA ST. So this in itself keeps parts count down and increases the free space on the motherboard a lot. A lot of the ST parts are generic. Though things like the MMU, GLUE, SHIFTER, DMA are of course not. Though these are obtainable as spares sold around the Internet, or scrap motherboards etc. There are a lot of "classic" parts, resistors , caps, TTL chips etc. For the moment they will all be re-created. Though its possible all the TTL chips could be mashed up into 1 single PLD saving parts count and PCB space in the future. Its possible a few parts of the circuit could be tweaked to save parts of PCB space. Though thats wok for another time.. I would have hoped someone by now would have helped create some new FPGA clones for the chips. I would really like a faster MMU using SRAM. ST-RAM is the main bottleneck for speed. Though overclocking the MMU is the only option at the moment. It is also limited to 4MB. 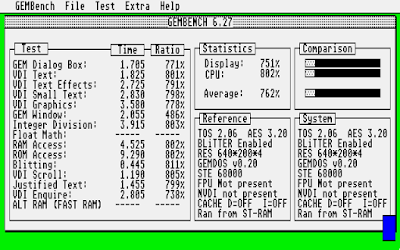 I'm sure tweaks could be done to give 14MB ST-RAM like the Falcon. If it was using SRAM then using alt-ram would simply not be needed anymore. I know there is code for MiST and Suska etc, though I know nothing about FPGA and not really sure those FPGA clones will work on a actual ST machine. Even so, someone would have to develop such things as I just do not have time to do everything myself. I would think a lot of the "work" the GLUE does is ROM decoding for example. Though in FPGA it would be easy to add in TOS206 support. Though such IC's would need to be 100% cycle compatible to emulate the real ST timings. I don't want to create a ST which breaks anything at all. Of course any boosters will break a lot of demos which need cycle accurate timings. Though that is the price we pay for speed. My concern here is, if everything went into FPGA, then we basically end up with a MiST anyway. So to a point it would become pointless to create a FPGA based machine as it already exists. So my aim is to emulate the ST 100%. The only way I see that currently is by using the original ST chipsets. AFAIK, MiST isn't cycle accurate and may have various issue with software. I want to keep the ST design "original". If FPGA can take over a IC 100% cycle accurate then I am all for that. There are probably a lot of tweaks which can be done. Though we want to get something built now rather than spending the next 5-10 years tweaking everything to death. New boards can be done in the future anyway if needs be. 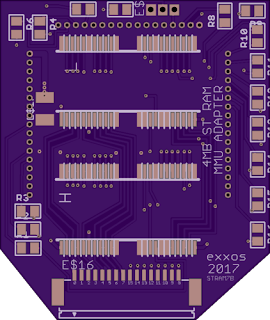 Everything can be in a socket, or even have breakout headers for each IC for future tweaks. So if someone wanted to develop a new GLUE or MMU, then it could simply "plug in" the motherboard. If something went into production, then people using the new Super ST motherboard could simply pop out the old IC and plug in the new FPGA based board. For starters I want to create the STFM schematic over to Eagle format. 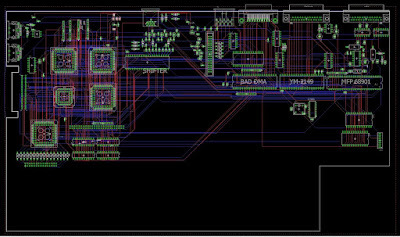 Once verified the layout of the PCB needs to be done. It will take some time to make sure all the connectors and such match the original PCB. Once down, that schematic will likely be released but not routed. That would be the "clone" of the STFM board. Basic changes will be done, such as ROM and CPU PLCC packages but not much else to start with. The whole design would be open source. A lot of "clones" and addons are not and re-creating upgrades over and over is just pointless and a annoying waste of time. As many also are aware, there are so many revisions of the ST motherboard, that its just impossible to create upgrades which physically fit on every revision. So likely around 80% of people around the world cannot even fit my upgrades. As mentioned before, a lot of my upgrades are for the C070789 board. There are several revisions of motherboard and all those people are limited to what upgrades I produce which fit. Its just not realistic time or cost wise to develop the same addon 20 times for fit each revision. Some boards still cannot be upgraded due to SMT MMU etc. There is also the fact that PSU's are failing where I offer alternatives, but motherboards are failing also. Take for example the video faults I have documented due to caps failing in the video circuit. Every electrolytic is 30 years old now. Servicing such boards is becoming a small nightmare. Again with so many revisions, supplying "servicing kits" for various things is becoming a huge investment, where I do not have unlimited funds, or time or space to go though every issue on every motherboard. A new motherboard would use ceramics as much as possible to prevent similar issues from developing in the future. The new motherboard will likely cost a lot to prototype. Several prototypes may need to be done. As the cost could be high per board (could even be around £200 a pop). Though by the time the buyer brought all the service kits and upgrades, then the cost probably wouldn't be much different anyway. 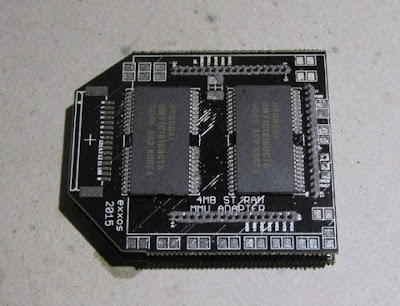 My aim is to re-use STFM IC's, possibly also a lot of the connectors and create a STFM "clone" which is basically updated. The STFM clone will be 100% compatible with a real STFM. Though as mentioned before, adding in boosters or other upgrades can be done easily. Also like my V2 booster, it holds TOS206, TOS104, and can be switched on or off for stock speeds or turbo speeds. The advantage is that it wouldn't any longer need the booster PCB, it would be as simply as plugging in a extra GAL / PLD to enable those features. The motherboard will likely get designed and made open source. Though my concern is here, again, is the end cost of the motherboard and people being able to assemble them. Overall, if someone purchased a STFM motherboard and fitted all my kits, the cost of the new motherboard probably wouldn't be much different anyway. I will likely have to set up a kickstarter campaign to fund this in due time. Then it will be up to the Atari community if this "Super ST" becomes a reality or not. First up I tried the new SMT paste.. This paste is is supposed to be better in all ways (won't go into it all). So I thought I would give it a try. Overall it stuck the resistors on just fine. Though I had a lot of shorts between the DRAM IC's. I was using a SMT stencil so the paste on each pad was pretty small really. Even so, the last paste I used was just plonked on anyold how and it worked great. So this paste appears to have more "meat" in it. Which is great for caps and resistors, but not so good for DRAM it seems. The problem with a lot of paste is the high temp needed to melt. The past I use melts at about 150C, most paste needs 250C and higher. I can't use the temp that high as around 200c the plastics start to burn and melt. So it limits my paste to basically 2 or 3 brands. Not like there is a lot of paste anyway to chose from. My new header pins melted to buggery. Actually the melted part was pretty neat really. Though the pins had just bent all over the place. So I thought, why not just put 2 PCB's on the bottom to hold the pins, and let the plastic melt. It wouldn't really matter as long it was holding the pins straight anyway.. I also tried manually soldering the pins like I had done in the past. Though even with the soldering iron on a low temp, using low temp paste, 2 seconds of heat and the pin just bent and melted anyway. So in the end I gave up with it. I did get some samples from harwin of the header pins so I tried those.. The pins are unfortunately pretty expensive at around 40p per strip. So it will ramp up the cost of the boards. Though I also have about 400 pins I can't actually use as well. Not to mention the amount I spent on SMT paste these past few weeks. I can only get the pins from the USA (im a UK guy!) and the paste will likely have to be imported direct from the manufacture in the USA also. So a lot of costs in postage and import taxes etc. All these costs have to be factored into the "cost" of doing the next batch of these and the cost just keeps escalating! I had a idea that since the plastic melted "neatly" on one test, but the pins dropped down all over the place, and the 2 PCB's on the back to hold the pins straight worked, but "squashed" the melted part, I thought of doing a mix of 2 things. Basically use the pins as before, let them melt, but only use 1 extra PCB on the end of the pins. This way the plastic can melt without it getting squashed by the second PCB I had on the back previously. This actually worked really well. The plastic melted "neatly" and all the pins remained straight and level. While "melted plastic" seems like a bad thing, I actually think its better doing it that way. Because the plastic is hardened onto the PCB and "glued" onto the base of the PCB. 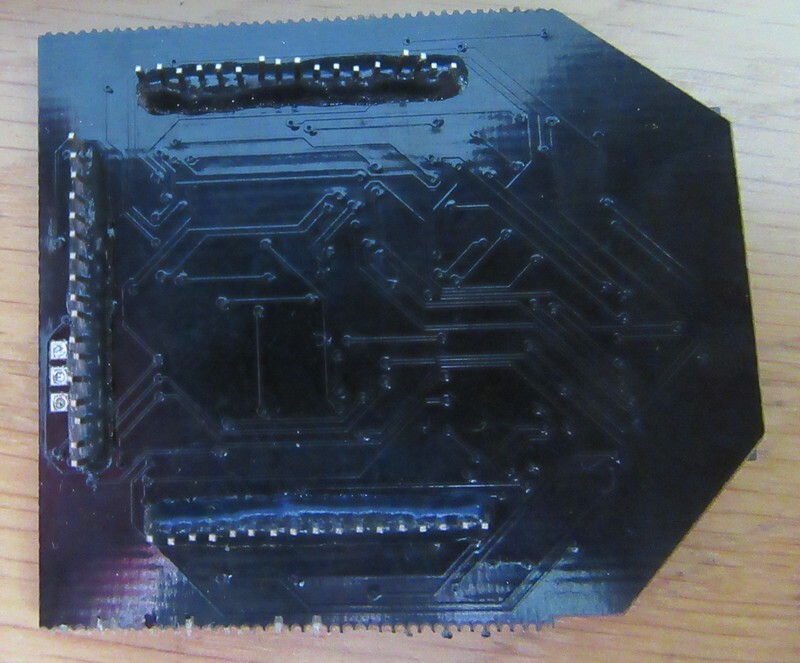 So not only are the pins soldered into the PCB, but now actually glued on the back making them a lot more secure. At least using this "cheap" pins means I don't potentially have to raise the price of like £2 per board just for the sake of using the Harwin pins. Overall I think as the pins are fragile, then "gluing" them to the PCB can only be a good thing. I created a new stencil which turned into a nightmare. I thought I would make the IC pads about 30% smaller to use less paste and reduce the shorts. Well, turns out Eagle (PCB software) doesn't like me drawing on the Tcream layer manually. In fact when export to gerber, the parts I draw by hand totally vanish! I can turn on/off the Tcream layer and the whole layer vanishes as expected. Though exporting, nope. Not gonna happen it seems. So that was a waste of a stencil. Well, now the 3rd one in fact due to various "issues". It seems near impossible to get help from cadsoft now. Farnell took over, and all I can find is a forum for help. Where, well, wasn't much help. So I decided to do a new IC lib with smaller Tcream areas and export that instead. At least then they would export as "normal" parts. Nope, not gonna happen either it seems. Eagle seems to automatically create the Tcream layer based on the copper pad size. So I had to change all the pads, which renders it useless for the actual PCB. So long story short, I ended up with 2 libs, a PCB fabrication lib, and a solder stencil lib. How annoying! So it finally came and I pasted it up.. I only pasted the IC's and pins this time. The pins looked pretty decent, just 1 small short. Probably could do with some more paste overall actually. The IC.. well, still shorts :( It also looks like some paste is actually missing of some pins, so no idea where that went.So pretty much another epic fail there. The paste I am using is class as "slump free". I'm assuming it means just that. Great for caps, resistors and such, but for close pitch IC pins.. nope.. I need it to "slump" , or well, actually flow on the IC pins and pads. So I think the "slump free" is actually hindering efforts as I have not had so much trouble with paste before. On the plus side, its a very clean board, no "splatter" anywhere. So my choice of paste so far , are paste which splatters everywhere which is impossible to clean, but doesn't short. Or a paste which is very clean and shorts everything out. So either spend time trying to clean the boards, or trying to fix them. Considering the amount I have spend in stencils and SMT paste so far, It makes me wonder if I had should have just got them assembled in the first place. Even so, I still end up fixing 60-80% of boards anyway. So basic SMT soldering is a nightmare for fine pitched stuff. My only real option is to go back to the paste I am happy to work with and try importing it direct from the manufacture in the USA. I think the solder splatter issue only happens when the paste is going "off", and since its basically 6-12months out of date buying it in the UK, then I don't really have much choice.